Mensa asked me to write a puzzle book for kids! is now out from Sky Pony Press. is out as a board book for preschoolers! the 2017 National Book Festival in Washington. My Teachers Pay Teachers "store" is open! Please check it out. Lots of digital puzzle books like these at great prices! Non-teachers can use the site. have topped half a million! I'm delighted you've come to my website! Hope you enjoy the puzzles, activities, and articles as well as the info about my books. WRITERS--If you write for the education market, I have a list of Educational Publishers for you. If you write for children's magazines, check out this page. My non-writing goal as an author is to help other authors achieve their publishing dreams. My writing goal is to make learning fun! Developing materials that help children enjoy learning and that help make the teacher's job easier is one of my greatest delights. I hope you have fun with my creations! The levels of the books range in difficulty from pre-school to adult. Every week I post new puzzles and activities for you. I have a poem in Highlights and puzzles in CHillKids and Fun For Kidz. 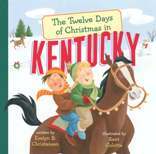 Sharing my KY Christmas books at the KY Artisan Center, Berea, 11-2:00. Signing books at Lexington Barnes & Noble 10:30-12:30. At the KY Book Fair, 9-4:00, KY Horse Park, Lexington. I have puzzles in Highlights and Pockets. My website is recommended in Children's Book Insider, p. 5. Enjoyed sharing my books at Barbourville's Redbud Fest. Fun signing books at Powell County Reading Celebration! 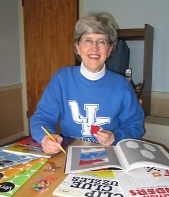 See my puzzles in CHill Kids, Kid's Imagination Train, and Fun For Kidz. At Books by the Banks festival in Cincinnati, 10-4. Guest blog at Smart Dummies September challenge. My puzzles are in CHill Kids, Kid's Imagination Train, and Pockets. At the Homegrown Authors booth at Lexington Farmers Market 9-noon. At Southern Kentucky Book Fest in Bowling Green. Review of my book is in Kentucky Monthly, p. 50. My book is in a Kentucky Living article, p.7. Courier Journal list of KY gift books includes mine. Article about my book in the Lexington Herald Leader. Thank you to Steve Flairty for the article in KY by Heart!